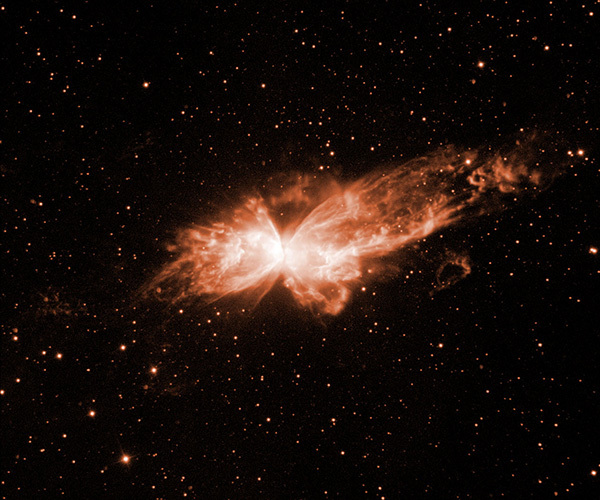 NGC 6302, also known as the Bug Nebula or Butterfly Nebula, is a bipolar planetary nebula in the constellation Scorpius. 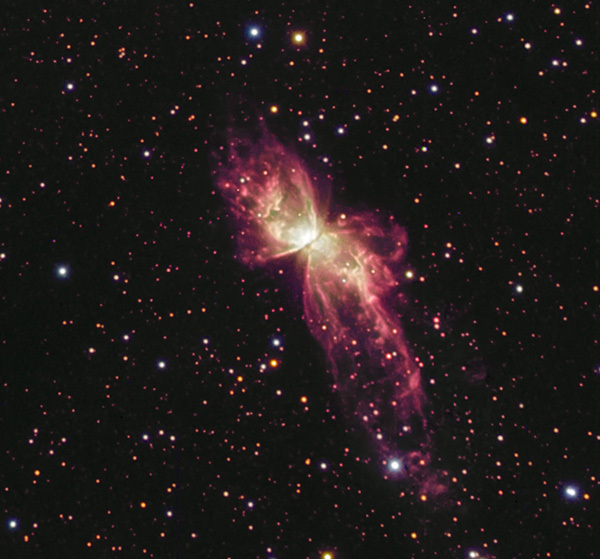 The structure in the nebula is among the most complex ever observed in planetary nebulae. Due to its composition, when observed with a telescope, its shape reminds many of a butterfly. Continue reading for five things you may not have known about this nebula. As it is included in the New General Catalogue, this object has been known since at least 1888. The earliest known study of NGC 6302 is by Edward Emerson Barnard, who drew and described it in 1907. Since then it has been the focus of many works and displays many interesting characteristics worthy of study. Interest in recent years has shifted from discussions over the excitation method in the nebula (shock-excitation or photo-ionisation) to the properties of the large dust component. One of the most interesting characteristics of the dust detected in NGC 6302 is the existence of both oxygen-rich material (i.e. silicates) and carbon-rich material (i.e. poly-aromatic-hydrocarbons or PAHs). Stars are usually either O-rich or C-rich, the change from the former to the latter occurring late in the evolution of the star due to nuclear and chemical changes in the star’s atmosphere. NGC 6302 belongs to a group of objects where hydrocarbon molecules formed in an oxygen-rich environment. The central star, a white dwarf, was only recently discovered, using the upgraded Wide Field Camera 3 on board the Hubble Space Telescope. The star has a current mass of around 0.64 solar masses. It is surrounded by a particularly dense equatorial disc composed of gas and dust. This dense disc is postulated to have caused the star’s outflows to form a bipolar structure similar to an hour-glass. This bipolar structure shows many interesting features seen in planetary nebulae such as ionization walls, knots and sharp edges to the lobes. 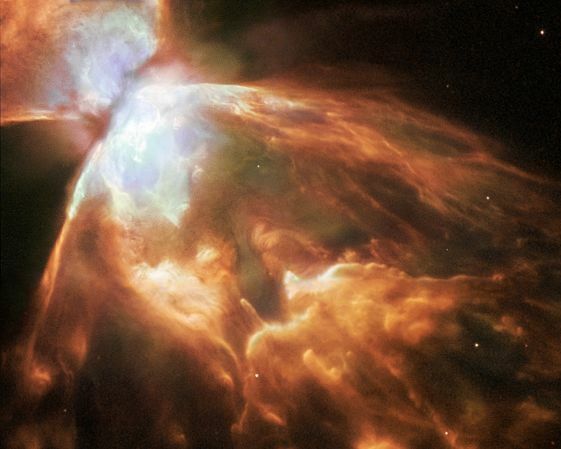 NGC 6302 has a complex structure, which may be approximated as bipolar with two primary lobes, though there is evidence for a second pair of lobes that may have belonged to a previous phase of mass loss. A dark lane runs through the waist of the nebula obscuring the central star at all wavelengths. Observations of NGC 6302 suggest that there may be an orthogonal skirt (or chakram) similar to that found in Menzel 3. The nebula is orientated at an angle of 12.8� against the plane of the sky.